AN exhibition celebrating the legacy of Patrick O’Connell, the Irishman who saved FC Barcelona from bankruptcy, was opened at Stormont on Tuesday. His story is being told by the Patrick O’Connell Memorial Fund at the Long Hall Gallery, where the exhibition was formally opened by West Belfast MLA Fra McCann. Although born in Dublin, Patrick began his professional career at Belfast Celtic and once lived in the Divis area. As a player he went on to play for Sheffield Wednesday and Hull City before captaining Manchester United. He was also the last player to captain a 32-county Ireland side before partition. After a successful career on the pitch, Patrick then pursued a managerial career in Spain. In 1935 he became the first and only manager to win La Liga with Real Betis, just seven years after he helped found the league in 1928. His successful spell at Real Betis saw him land a job at FC Barcelona just before the outbreak of the Spanish Civil War in 1935. With the war intensifying the Catalonian club faced persecution under Franco and was almost financial ruined as a result. In an attempt to save the club, Patrick took the team on a ‘tour of salvation’ to Mexico and the USA to raise crucial funds. Fergus Dowd from the Patrick O’Connell Memorial fund explained how the manager saved the club from extinction. “During that period there was a man called Josep Sunyol, who was the president of the club, and he was assassinated by Francoists in August 1936,” he said. “Patrick was in Belfast when that occurred and he received a telegram from the club to say that they understood if he didn’t come back, but he did. Only four of Barcelona’s players returned from the Americas, but Patrick rebuilt the team and stayed with the club until he was forced to leave by General Franco in 1940. After the Civil War he returned to Spain where he managed Sevilla FC between 1942 and 1945. He then moved to London where he would eventually become homeless. Patrick died of pneumonia in 1959 and was buried in a pauper’s grave. A long fundraising effort by the Patrick O’Connell Memorial Fund saw his grave restored and fitted with a headstone just last year. 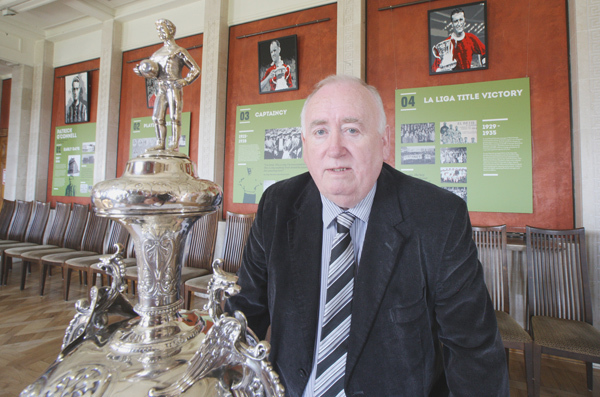 Speaking at the opening of Monday’s exhibition, Fra McCann MLA said: “The story has great historical significance in local and international football. It’s important that we keep the names and the legacy of Patrick and others alive because so often they slip into oblivion. A blue plaque administered by the Ulster Historical Circle will be unveiled in Patrick’s memory near his former home in Albert Street on May 12. Imacculata FC will host the inaugural Copa Don Patricio (Patrick O’Connell Cup) for 13 and 14-year-olds on May 13. The Stormont exhibition in the Long Gallery runs until May 12.